Located around 5 km from Cherrapunjee, Nohkalikai fall is the fifth highest waterfall in the world and the highest plunge waterfall in India. Falling from a height of 1,100 ft, this fall is a great attraction of Cherrapunjee. Earlier, you had to really trek hard in order to reach the falls but today, thanks to the well developed roads, the drive to Nohkalikai Falls is through the elevated tableland that leads to the cliff and then hike a short distance to a viewpoint. From the summit of that viewpoint, you are bound to witness the enchanting sight of the beautiful Nohkalikai waterfall plunging down into an ultramarine pool. 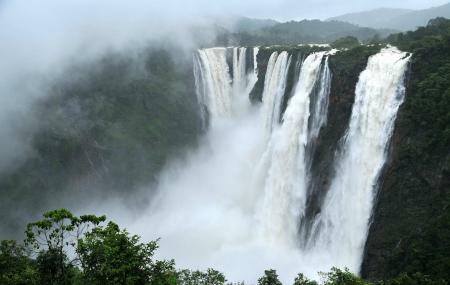 The falls are at its most spectacular during the monsoons when a lot of water volume is added to it. Behind this breathtaking beauty, there is an unfortunate legend associated with this waterfall. It has been christened as Noh Ka Likai that means "the leap of Likai". According to the legend, a young woman named Ka Likai, who had a daughter from her earlier marriage, got remarried. Her new husband got jealous of the excessive love that the mother had for her daughter. He decides to kill her. When Ka Likai was away working, he slaughters the girl and uses her flesh to cook a meal. After returning home from work, Likai ate the meal without suspicion and had no inkling about the gory act her husband had conducted. However, she later discovered her daughter’s fingers in the betel nut basket. Distraught with grief and remorse, she rushed to the nearby cliffs and threw herself over the precipice adjoining the waterfalls. The fall has ever since been known as Nohlakikai. It is advisable to carry food and water when visiting the falls for extended periods of time. There is a short hike towards the falls. How popular is Nohkalikai Falls? People normally club together Don Bosco Shrine and Sa-i-mika Park while planning their visit to Nohkalikai Falls. It's a good place to visit... But you have to go approx 100 stairs down. Temperature is normal there. You will also purchase some hand made artifacts there and place so have a restaurant where you can have your launch. I had egg Curry there and the it's was good. You can find veg and non veg both. Enjoy !! A breathtaking view and an enchanting story about the falls, Nohkalikai Falls view point is another must visit spot in Meghalaya. Well the history of the place you can research it anywhere else...but all the ladies if you want your spices, honey, bay leaves this is the spot. The view point is managed by the local tribes and astonishingly they do it better than any govt. The entry fee is Rs 20 per head and there's ample parking space. The toilets are clean and well maintained. The pineapple and fruits stalls are a must visit. For Indians I assure you that you wouldn't have had pineapples and oranges so sweet anywhere in India. Had gone in Feb so the fall was just a thin stream of water. But I can imagine how beautiful it might be. The place from where the tourists can watch has got all the amenities to keep the surrounding clean BUT UNFORTUNATELY there is garbage lying around . On a positive note,do eat the fresh pineapples. Now this is real beauty. A view you would remember all your life. The magnificent view ant the sound of water fall is amazing. The greenery surrounding the falls , the hills is just spectacular. The view point is absolutely amazing with the place being exceptionally clean. There are plenty of cute stalls selling some very very fresh pineapples that taste absolutely divine. There are some very cute trinkets you can buy as well. When it rains, the waterfall is in full flow and is supposedly a lot more beautiful than the winter season when I went. It still was an amazing sight with a thin stream of milky white water flowing down a huge wall into a bright blue pool.